If you’re looking for a diamond ring, it’s always important to consider the 4 C’s: Cut, Colour, Clarity, and Carat. The 4 C’s are a universal language for talking about diamonds, so if you know what you’re talking about you can make an educated purchase wherever you go. While many people think Cut refers to shape of the diamond, it actually refers to how well the diamond’s facets interact with light. Colour measures the degree of colourlessness in the stone – when referring to diamonds, less colour is better. Clarity refers to the number, size, relief, nature, and position of inclusions and blemishes. Carat refers to the weight of the diamond. Once you’ve established the 4 C’s of your ring, it’s important to consider the shape of your partner’s finger. Knowing how different stone shapes and band widths work with different finger sizes can make a drastic difference in how the ring looks on her hand. When considering what design to choose for her finger shape, it’s all about balance. 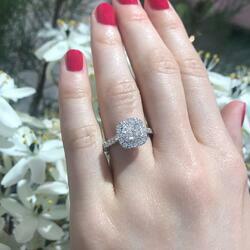 For example, elongate short fingers with thin bands and long shaped stones, such as an oval, pear, or marquise shape. 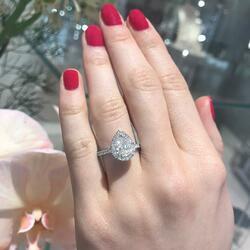 Our Pear Halo Engagement Ring is the perfect ring for a bride with short fingers. The elongated shape of the gorgeous 1.00 carat Pear Shape Diamond will draw the eye upward and add the illusion of length. Balance long fingers with a wide band and round, asscher, marquise, or radiant stones. You can go for bolder pieces if she has longer fingers, because it won’t overpower them. 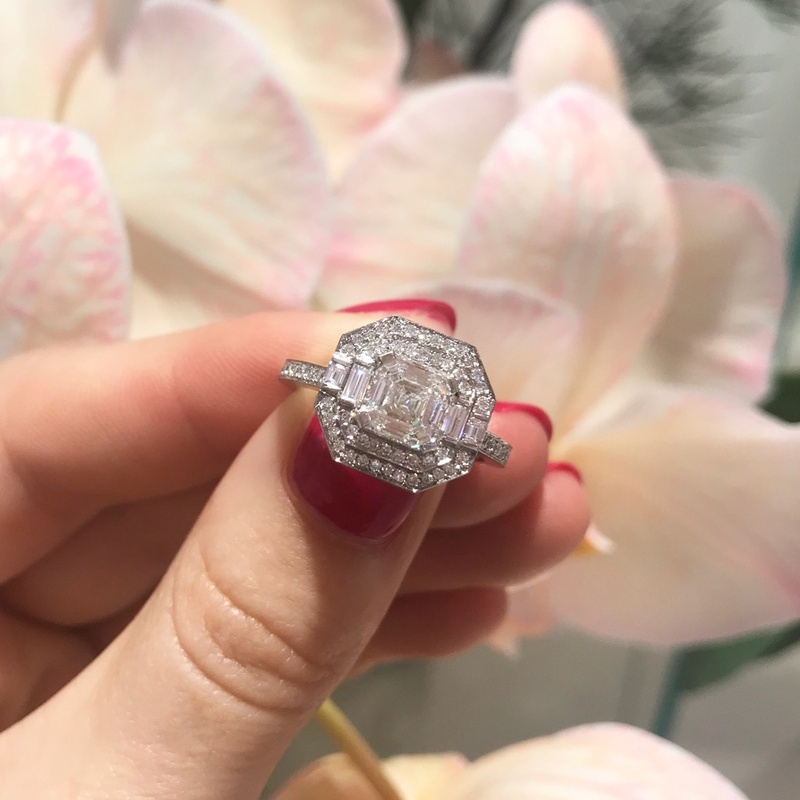 Our Art Deco Asscher Cut Twin Halo Engagement Ring is the perfect ring for someone with long fingers – the stunning piece is big, bold, and features an impressive double halo. Similarly, adorn shorter fingers with higher carat stones and cluster styles – a solo small stone will look even smaller against a wide finger. 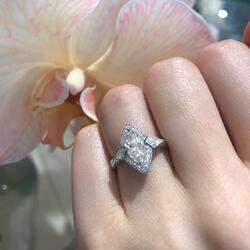 Our Platinum Marquise Art Deco Engagement Ring hosts a spectacular 1.02 carat Marquise Diamond at its centre. The length of this ring will balance her fingers and make them appear long and slender. When it comes to slender fingers, stick to smaller stones to avoid overpowering your fingers. 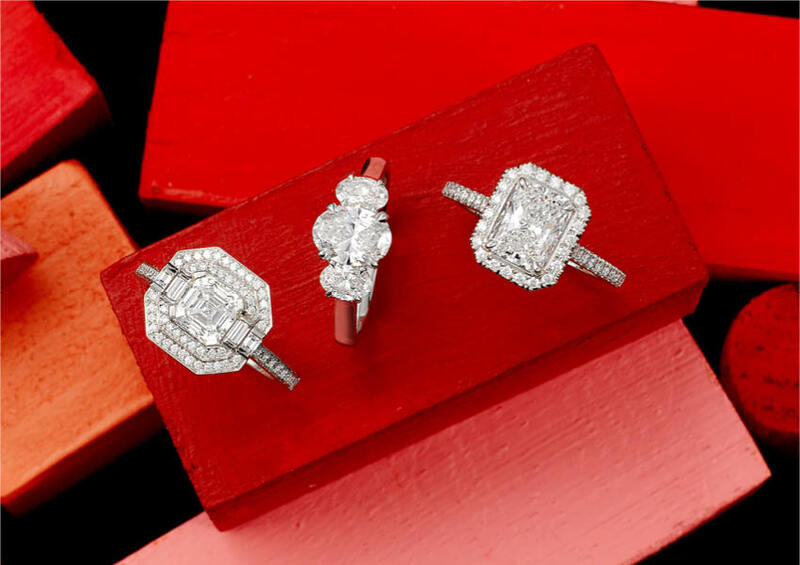 Small round, princess, or oval stones will complement slender fingers beautifully. Different metals will also affect the look and feel of your engagement ring. You can base her preference for metals off of the jewellery she wears on a daily basis. If your partner typically wears cooler, silver-toned jewellery, select a ring with Platinum or White Gold. If she tends to gravitate towards warmer tones, then Yellow Gold and Rose Gold are better options. Our Cushion Cut Diamond Halo Engagement Ring is an excellent option for the bride who prefers cool toned jewellery. Featuring a sensational Cushion Cut Centre Stone, a Fine White Halo, and a Divine Diamond Set Band, the 18 carat White Gold ring exudes elegance and class. Mixing metals is a popular trend that can add a unique touch to your ring. Depending on the metals used, a mixed metal engagement ring can produce a more vivid contrast between the feature diamond and the band. For additional expert advice on selecting the perfect engagement ring, download our Ever After Guides.